Dear André, Beat, Peter, and the Pioneer Family,Once again we would like to express our appreciation about the excellent craftsmanship and your outstanding crew, especially Beat and Peter, who did a tremendous job in every respect. It was also a pleasure working together you (André) and your team in the office. As you know we traveled extensively throughout BC and the United States to find the right home for us, and the right company to do the job. 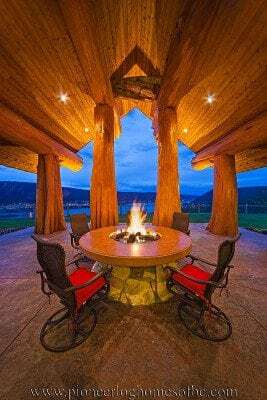 Coming together with your company showed us all the beauty of a cedar log home and the special characteristics, which only a cedar home can give. And the decision to choose your company as our log homebuilder was a very lucky and satisfying one from the beginning to the end. We would love to talk to anyone interested in a log home, make the right choice, choose Pioneer, they will not disappoint you!